Think you can pull off wearing a ring? How about multiple rings? The inquiries will start flowing in and you should be able to answer them without pause. Even if you’re not much of a talker, rings are a big conversation starter and you’ll want to know what you’re saying when people start getting curious. Beyond just the questions you’ll get, new rings can feel awkward and heavy. It’s best to wear it around the house a bit, get used to how it feels and how the weight works against your fingers. Typically, a ring means something, whether or not you mean it to. For instance, golden rings imbued with large stones symbolize wealth and power while wedding bands are a sign of a great attraction. Class rings, depending on which institution it’s from, can signify power and honor and may even tell a little story about yourself. More than just where the ring came from and what it may symbolize, which finger you wear your ring on also makes a difference. Rings worn on the pinky, outside of being more visible, are usually worn to make a statement. Those on the ring finger, worn on either hand based on local culture, usually indicate marriage or engagement. 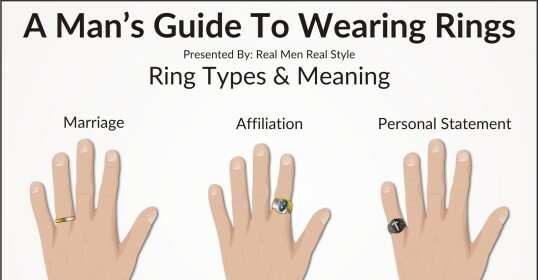 Should you sport a ring on your middle finger, an uncommon adornment due to its awkward placement right next to the index finger, you’ll display structure and balance. There was once a time when rings worn on the index finger were an indication of family status, giving them a look of authority. Finally, if you can find a ring that fits around your thumb, you’ll be depicting wealth or social influence. Each finger also links up to astrological symbolism, with the pinky being associated with Mercury, the ring linking with the Sun, the middle finger associating with Saturn, the index finger with Jupiter, and the thumb with Venus and Mars. As you’ll find with any jewelry that you wear, the size of your ring does make a difference. No, it doesn’t have anything to do with symbolizing but just about making sure it looks best against the size of your finger. When shopping for rings, take into consideration the size of your hands and how certain sized rings will look on this. For instance, if you have somewhat larger hands, you’ll want to look at rings that are thicker or have larger embellishments. Smaller rings can look off when worn on thicker fingers while larger rings can actually look uncomfortable on smaller fingers. In regard to sizing, you also want to ensure the ring diameter is sized to your finger. Too loose and you could easily lose it. Too tight and you may not be able to get it on or off. If you’re being gifted a ring, try to make sure it’s sized appropriately. Some rings, like those made of tungsten, can’t be sized afterward. 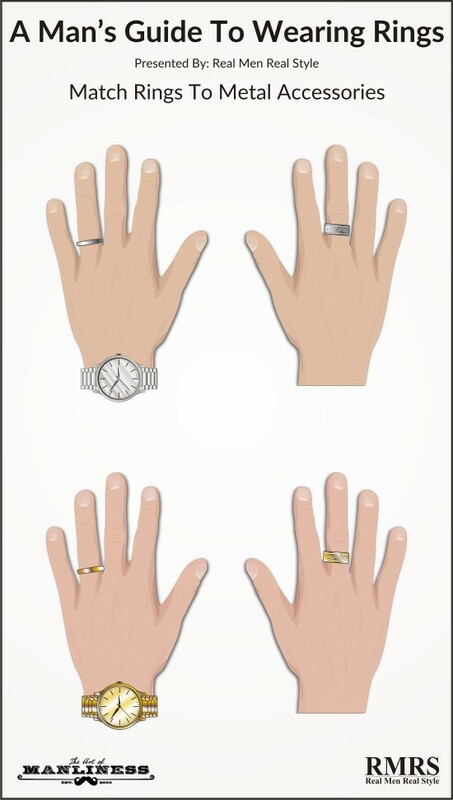 This doesn’t apply if you’re only looking to don one ring, but if you’re going to wear multiple rings or other jewelry, it’s important to balance your hands out. Too many rings can crowd your hands, look messy, and can really weigh down your movements if they’re heavy enough. A good rule of thumb – no pun intended – is to keep from wearing them all on one hand. Space them out and wear thinner rings on the same hand as thicker rings. If you’re wearing a bracelet or watch with a ring, it’s always best to wear them on the opposite side. It’s ill-advised to wear so many rings that you have to place them next to each other. On top of looking cluttered, it will get uncomfortable, especially if you try to wear more than one ring on a finger. To get away with wearing multiple rings, you’ll want one that serves as a focal point and others that are more complimentary. You can pretty much wear whatever metal you see fit, but if you’re lost on what metal would look best on you, it’s all about your skin tone. People with warmer tones, where your veins aren’t quite visible, will want to wear gold while skin of a cooler tone looks best with silver. You also want to consider any other jewelry you’ll be wearing. Uniformity always looks best, so if you’re wearing a gold watch, a gold ring will look best. There are different shades of gold, so don’t go crazy trying to match them perfectly. Silver and gold aren’t the only metals out there, however. Tungsten carbide, platinum, titanium, and palladium offer a variety of different colors, luster, and weight. You can find some amazing rings available Here.